10. Good set of knives particularly a chefs knife. Do not cheap out of here. Trust me you and your fingers will hate yourself if you do not follow this rule. Also you're chopping skill will only get better with a proper chefs knife. You don't need to go out and buy every type of knife, decide what you need/ do most in your own kitchen. As a rule have about 5 including your chefs knife (8 or 9 inch), a paring knife, serrated knife, (2) 6 inch utility, as well as a wooden block to keep them safe. Make sure the blades are stainless steel, molded or riveted handles made from forged steel will last forever and are worth the investment. You will also want to have a sharpener and a pair of kitcken sissors. 9. Selection of cutting boards. Ideally you want a woden block for bread fruits and veggies, and plastic for raw meats and fish. This set of index style cutting boards by Joesph and Joseph is great way to keep everything organized. You can also create your own set by just buying different coloured cutting boards and using a colour index. Red is for red meat, blue is for poultry, green is for fruits and veg and so on. 8. Cast Iron frying pan. There are a few things to know about cast iron cooking. The pan needs to be seasoned before used. To do this you must fry onions in a generous amount of oil (not olive oil). Seasoning will create a non stick surface and make it easier to cook in afterwards. Cast iron can last a life time if cared for properly. You NEVER want to put a cast iron pan in the dish washer - this will ruin it. These types of pans are prized for their ability to distribute heat evenly and hold up to very high temperatures. There are a number of ways to clean your cast iron - I like to use a very little soap and warm water with a soft sponge (and only if necessary) and wipe with a think layer of oil when dry. Otherwise I will just wipe with paper towel. 7. Pots and Pans. Depending on what your cooking abilities are you may not need such a large set. I would start off with a large pot for soups and boiling water (for pasta veggies etc) and a medium frying pan. I have a combination of stainless steel and non stick and I use them for different purposes. The benefits to stainless steel is that they can stand high temperature and are the best for building flavor, searing meat etc... Non stick are great for eggs and anything else if you are a beginner cook. I only buy pots and pans that are oven friendly ie they do not have plastic handles. Make sure to read your labels before use. 6. Kitchen tongs. These are probably one of the most useful tools in the kitchen, you should have a few different sized. An extra long one for bbqing or use on a spitting stove item, medium for anything in between, and short for salads. Make sure to get thongs made of steel if being used on heat. The self locking ones are just the best! I really like the OXO brand of small utensils. 5. Peelers. You really only need one peeler, and you're best off buying a Y shape. These are the easiest to use and cover the most are in one swoop. I just adore my Swissmar set of three from William Sonoma. appliences. 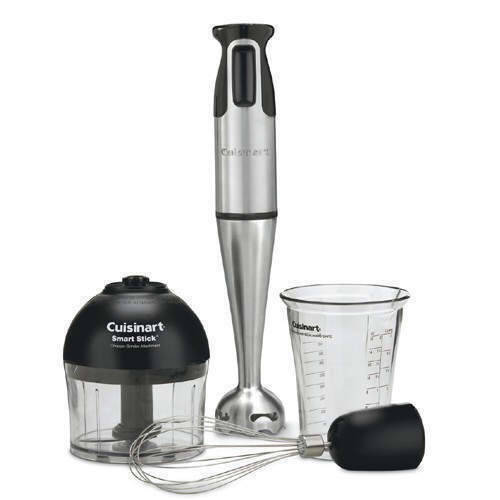 You can make amazing bean dips in minutes, home made mayonaise is a snap (although I always make mine manually) This set by Cuisinart is amazing! It comes with a mini chop attachment and whisk (which I have yet to use). The immersion blender works much the same way a traditional blender does, just be sure the blades are immersed before turning it on. 3. Fine Mesh Sieve. These make life so much easier when straining small pasta, lentils or vegetables. I also use it to wash/ rinse anything. I like the ones you can hang, although if you prefer this can be swapped for a standing colander or you can even find ones that fit across your sink. The basic difference is the size of the drain holes. 2. Food Processor. I know there is already a mini chopper on the list but the foodpro is like no other. With the assortment of attachments this tool is a real life saver in the kitchen. It makes chopping, shredding, grinding and mixing much less monotonous. 1. Graters. 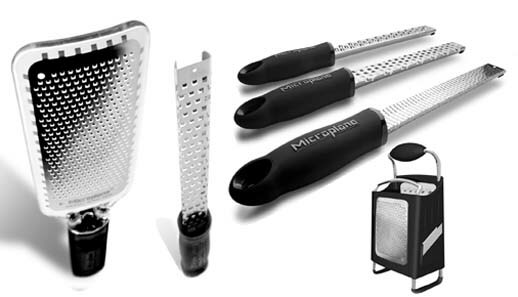 Do yourself a favor and just buy Microplane which is both the brand name and the type of grater. It's one of those long thin ones. I would get one of those for your citrus zesting, garlic, nutmeg etc... and a box grater if you insist for your fruits vegetables and cheeses (although your foodpro will have an attachment for grating as well). There you have it folks! This by no means if a lift of everything you need for a well stocked kitchen, just the absolute must have's. These little thing will making your time in the kitchen more efficient and hopefully inspire you to do more cooking. I'm a HUGE fan of cooking with cast iron and clay. I find the most effective way to thoroughly clean my iron skillets is with kosher salt & a paper towel while it's slightly warm- it absorbs all the grease and acts as an abrasive resulting in a black beauty. The white gazpacho looks awesome. Thanks NOLAchef! Love your blog! It's relaxing to read a high quality article for a change. You have made many interesting factors and I agree. This kind of has made me think and then for that I give thanks to you.